BustedSpoke.com - View topic - Snow Bowl (Camden Maine) lift access New England source for mountain bike trails, bike pictures, trail maps and more. The mountain has a lot of great potential. We're hoping that we get enough rider support and generate enough momentum to progress with more DH trails (for all abilities) and more lift access dates next year. Snow Bowl has been on my list to visit for years, I'm definately gonna make it up this year. Here's a question for the locals..........Should I bring my DH rig too or is a 6 inch travel bike more than enough for the current trails? 6 inch is plenty. There is some really sweet singletrack that is worth riding all over that mountain. Lift day for this Sunday (June 12th) has been canceled due to pending thunderstorms. Be sure to check [url="camdensnowbowl.com"]camdensnowbowl.com[/url] for future updates. Trails improvements are happening weekly. 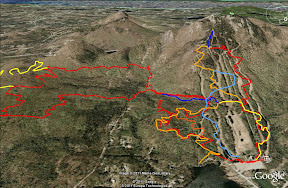 Expect an additional 3-4 miles of trail mapped and signed within the next couple of weeks. I rode 'Natty Tread' one day last fall. It was a blast! I was really impressed with the quality of the trail for a free bike area (we pedaled up). Any skill level should be able to enjoy it, I think, although there are a couple of steeper chutes closer to the top. There were a couple of wet holes closer to the top that could probably use some attention. Pump track is well constructed too! Thanks for all of your hard work down there, is the fat tire festival gonna be going on again for Summer 2013?